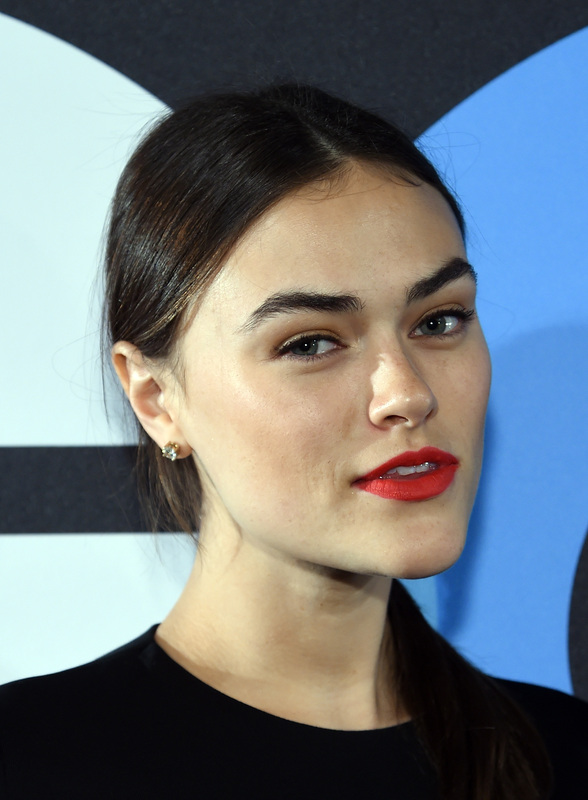 On April 27th, Elle Magazine published an essay by writer, artist, and model Myla Dalbesio entitled, "When Did Fashion Change Its Mind About The Size 6 Supermodel?" (You might remember her from that now-notorious ad campaign with Calvin Klein last fall.) How Dalbesio described a certain shift that took place in the mid '90s within the fashion industry resulting in a preference for the "heroin chic" look honestly disturbed me. Although I've thought about this "phenomenon" many times before, it wasn't until I read Dalbesio's words that my feelings on the subject changed from interest to anger. Dalbesio discusses how the age of the "supermodel" in the '80s and '90s evolved into the age of a kind of "submodel" (my own term). She details how the Cindy Crawfords, Naomi Campbells, and Linda Evangelistas of the world turned into the nameless, emotionless, waify prototypes still seen often today. And Dalbesio's realization upon delving into the subject with casting director Julia Samersova is that the shift that took place wasn't an accident or something that "just happened." It was a deliberate choice made by clients, agencies, and directors within the industry, arguably because people couldn't handle a strong woman who controlled such a large amount money. In what felt "out of nowhere," the luscious, vibrant, and powerful woman began to be replaced by the image of a drugged up, bland, and powerless girl in keeping with the '90s penchant for grunge, perhaps. This one representation of beauty and femininity is, for Dalbesio, the complete opposite of a person in control, and rather someone being controlled. As a woman, I cannot stand to know that we've been silenced in such a way out of fear of our real worth, or in the name of trends. We've all likely been duped into believing the lie that what we're supposed to be is something we don't have to be. Although I don't think the fashion industry of today is quite as problematic as it was in the later '90s, no one can really say exactly where we are at this time in fashion history. We probably won't know until reflecting back 20 years from now. If someone asked me what was going on in fashion right now, what is the modeling trend in this moment, I would say that we are in a time when shifts in diversity are the focus. Look at my girl Ashley Graham's curves in this year's Sports Illustrated swimsuit issue, Zac Posen's beautifully diverse F/W 2015 showing, Candice Huffine's much discussed appearance in the Pirelli calendar. But, as Julia has observed from her unique position as a de facto liaison between the hopefulness of models and and brutal reality of what brands are willing to do, we still have so far to go. Dalbesio also explains how social media has revolutionized the way modeling agents and casting directors choose models, and how the number of likes and followers they have on Twitter and Instagram play a huge role in getting jobs and contracts now. Even Vogue has declared that we are now in the age of the "Insta-girls." To know that models are getting jobs based on the amount of followers they have puts us in a very easy position to sway the attention to the personalities, shapes, and sizes we really wanna see out there. A major modeling platform needs to be granted to more inspirational women, á la Tess Holliday. So find as many aspiring models, photographers, and designers who support body positivity and size acceptance as you can, and follow and promote them. Get behind their cause and use their hashtags. Make new ones as things arise that bother you. Your own friends and followers are influenced by your voice, so make it count. Celebrities are more accessible than ever because of Twitter, so that means that the fashion and beauty industry front runners (like designers, models, and photographers) are as well. Twitter has allowed people with a ton of influence to get involved in conversations with the average person, so take that opportunity to speak out and Tweet the people in the spotlight about your concerns and ideas. Even if there isn't a response at first, once enough people are doing it, it's bound to be noticed. Where our money goes has always been a huge way that we can make a statement. If you don't like the way a company promotes its clothes, don't buy from it. Find other places that deserve your dollars! If you feel like you don't know where to start, that's the brilliant thing about hashtags! Many publications and media platforms these days are all about promoting fashion brands that are changing the standards, so keep your eyes ready! Your own body and the way you style yourself is a walking billboard to your circle of influence. So don't hide your body, whatever its shape or size, because you have the opportunity to change the way people see you just by the way you present yourself. Get to a place where you love yourself, because that is when you are going to be the most influential, whether it be on social media or IRL. Talk about these issues if you're passionate about them, and don't be afraid of what other people think in return. You have no idea how many people you can set free. As I said before, we cannot let the fashion world dictate who and what we see on our screens (whether it's the TV, computer, or phone screen) anymore. We have to seize this opportunity to make a change — it's completely within our reach.